Greenwich Girl Scout Brett Edmonds shows whats under the hood of her car at her home in Old Greenwich, Conn., Friday, August 31, 2018. 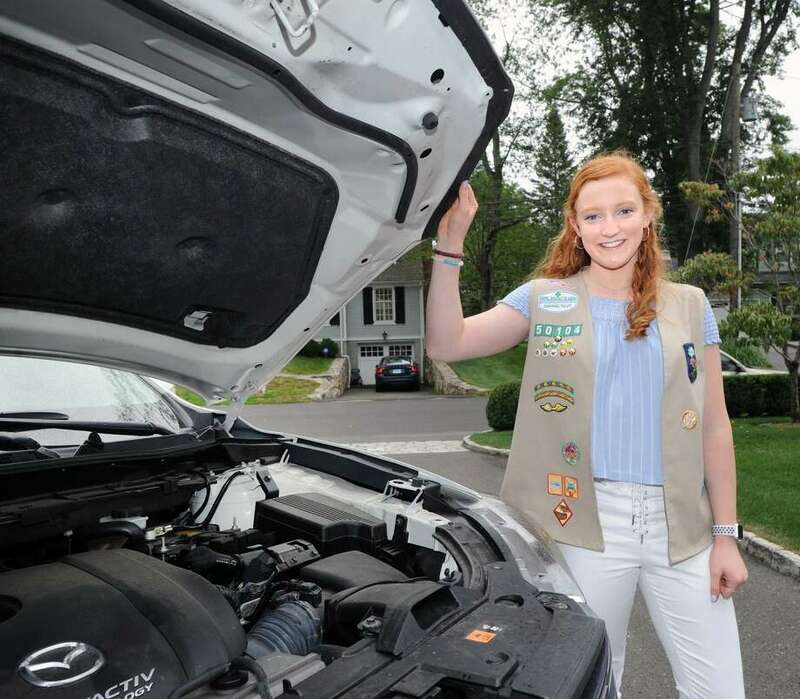 Edmonds, a senior at Greenwich High School and a member of Old Greenwich Troop 50104, has been working to earn her Girl Scout Gold Award by teaching classmates about the basics of car maintenance as well as car safety. GREENWICH — Greenwich High School senior Brett Edmonds knows most of her classmates have the means to pay for driver’s education courses to help prepare them to take to the road. But, Edmonds wondered, how many know how to check a car’s tire pressure or what to do when the “check engine” light glows on the dashboard? So Edmonds decided to do something about that, making teaching her peers about simple car maintenance and safe, undistracted driving a community project to earn her Girl Scout Gold Award, the highest award in Girl Scouting. Edmonds, who has been a Girl Scout since the Brownie level, was also spurred on a tragedy: The teenage son of one of her mother’s friends was driving his sister to school recently, when they were involved in a car accident. The son died and the daughter was left in critical condition, Edmonds said. 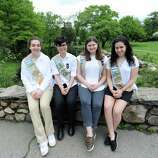 In order to earn the Gold Award, Senior and Ambassador scouts in grades 9 to 12 spend at least 80 hours researching issues, assessing their community’s needs and resources, building a team and making a sustainable impact through their project. Edmonds reached out to AAA, car insurance companies, driving schools, emergency personnel and nonprofits dedicated to teen safety. Soon she had enough experts onboard to schedule two morning assemblies and a May Safe Driving Day at the high school. AAA sent mechanics to teach hundreds of students basic maintenance skills, such as changing a tire, adding windshield wiper fluid and more. In addition, Edmonds worked with school officials to incorporate a Safe Driving Pledge into the requirements for a parking permit for all Greenwich High School seniors. Kathy Steiner, a wellness education teacher who helped advise Edmonds, said she believes her peer-to-peer approach is often more meaningful for teens. Edmonds, the daughter of Karen Carter and Scott Edmonds, said the experience has made a difference in her own life. “I think this project has kind of shaped me as a person,” she said. Not a big fan of public speaking, Edmonds said she gained more confidence by addressing fellow students at the assemblies. Now she’s vice president of Student Concerns in student government. The accomplished gymnast and sprinter is also coaching younger students at her gym, Arena Gymnastics in Stamford. Once she finishes a final interview on her project, she’ll officially receive her Gold Award, just as her sister Paige, a sophomore at Wake Forest University did before her. Though she hopes to be studying biomedical engineering in college next year, she’s glad GHS’ Outreach Club will take control of Safe Driving Day, making it an annual event. “I definitely want to be a part of it next year if I can,” she said.